Aarti Krishnakumar: Skywatch Friday - Sky shimmers!!! Skywatch Friday - Sky shimmers!!! It left us in awe!! 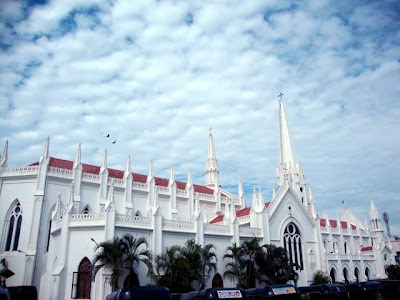 The Santhome Church [also referred to as the Pencil Church] is truly one of Chennai's landmarks!! Went into this magnificient place of worship as part of the Peacock trails 2weeks back!! Click here for more Skies!! Lovely photos, lovely words. Nice header, too! the first snap is too good, no??? btw, you have chinese friends also?? ?